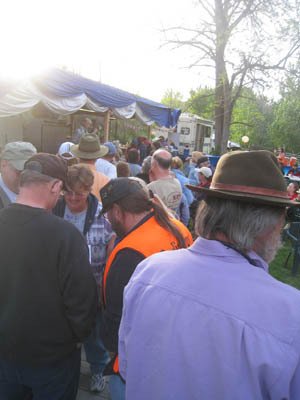 A whole slew of riders and officials arrived in Oreana basecamp Friday, including my pal Gretchen Montgomery from Bridgeport, California, coming to get her Merri fix. Gretchen and I used to ride together 3 to 4 times a week in the summers in Bridgeport, but now, I get to see her only once or twice a year. 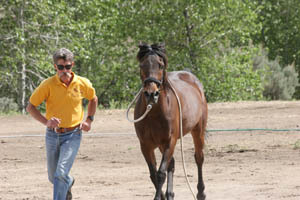 She brought two horses, and as it often goes in endurance riding, plans change. I was going to ride Bev Gray's horse True Colours on Day 1, but, it was decided that Amanda Washington could ride him on Day 2 since she needed a horse to ride, and since Colour only needed one ride, I could now ride Gretchen's horse Royal Raffiq - who I've done 750 miles on over the years - with Gretchen and Spice on Day 1. Camp steadily grew bigger throughout the day as more riders pulled in with their rigs, from the fancy 5-horse trailer with living quarters up to the 70's campers pulling a 2-horse and the little truck and trailer with a tent on the side. 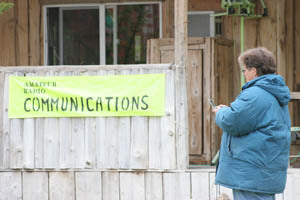 Riders took their horses on rides or walks around camp, the radio crew worked hard on setting up their base station at the house, and horses were vetted in with the veterinarians Robert Washington and Michael Peterson. I was dressed for a warm-up horse ride - chaps on and gloves in hand, when I was called on to make a last-minute chauffeur run to the airport. Connie Creech was my first pick-up; she would be serving as president of the Ground Jury in Sunday's FEI 100-miler. 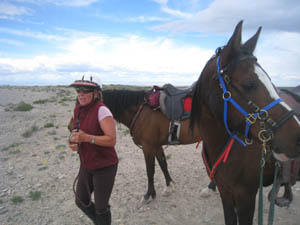 I've ridden with Connie on many Nevada trails and attended many of the rides she puts on there. 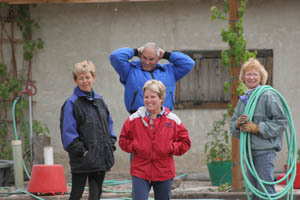 We talked horses (what else) while we waited for the next person, Trish Dutton, who'd be the official ride secretary. Steph saw her in action at the New Years in New Mexico ride, and snapped her up for this ride. And, it turns out that Trish lives just down the road from my niece in Texas, where I first started my endurance riding 9 years ago. I never seem to have enough time at endurance rides to visit with people - old endurance friends I haven't seen in a while, endurance friends I have seen lately but still want to visit with, and special old endurance friends from around the world - like Belgium and Guatemala, and new ones - like El Salvador and Spain. 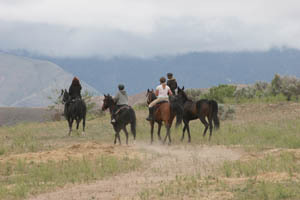 And this ride was no exception, because there were pictures to take and upload, horses to ride, horses to vet in, horses to gather and feed, gear to get ready, (like attaching my Raven bag to my saddle), an airport run to make, a ride meeting to attend, and of course, another great dinner to eat, catered by Owyhee ride regulars, Debra and Al of Blue Canoe Catering. It was good to see international riders here, from Canada, Argentina, and Belgium, for the FEI 100-miler, and it was also great to see many of the usual local riders - including (among many others) Tom Noll and his famous Frank; Karen Bumgardner who'd be riding her gelding Thunder, the horse that got lost for 6 days in November (you can see the scars the girth left on him); Jim and Vicci Archer who'd be attempting their first 100s after 8 seasons of endurance riding; and Nance Worman and Chris Yost who would be attempting the 50 mile-100 mile-50 mile Triple, which they both accomplished last year. Let's take a minute to look at this closer. 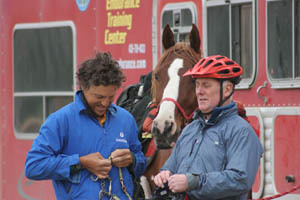 Picture it: getting up early Saturday morning, doing a 50-mile endurance ride on one horse. Which in itself can be just enough to pleasantly tire you out. (And, by the way, after the finish, Nance would have to drive back to Boise for her step-son's graduation, and return to ridecamp late at night). Getting up earlier on Sunday morning for a 6 AM start (on another horse), riding 100 miles, finishing at least 14 hours later. Which, by now, would definitely wear you out, enough to curl up into a tiny ball in bed and not move for the entire night, once you got to bed, say, around midnight. Getting up early Monday morning, getting back on the horse you rode Saturday, and riding another 50 miles. These are a couple of obsessed endurance riders, no? Tennessee Mahoney would also be attempting the Triple. When she left Colorado on Thursday with two horses, a few hours down the road she got a call that a tornado had ripped through her hometown, causing extensive damage to nearby property including her neighbors, throwing quarter-ton hay bales around, although luckily her house was not hit. What could she do? She kept on driving to Oreana. New adopted local Connie Holloway, a Fairly Newbie, who just might soon become a resident of Pickett Creek here, would be riding her beloved Phinnaeas on a 50 on her birthday. Fairly Newbies Shana Bobbitt arrived from 7 hours away with her horse MSF Sinwaan and her friend Lara Hall, for her 3rd endurance ride ever; Laurie Wells would be riding in the trail ride on Sunday, and attempting her first ride ever, the 25-miler, on Monday. Then there was, of course, veteran endurance rider and local - the Raven, riding along with me in his Raven bag for his 3100+ miles.